The Atacama Desert is a plateau that occupies the northwest parts of the Chilean coast on the continent of South America. 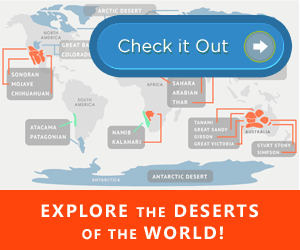 It is the driest desert on the earth coming second only to the Antarctica. It is, in fact, 50 times drier than California’s Death Valley. This is ironic considering the desert is next to the world’s largest water body-the Pacific Ocean. On your first trip to the Atacama Desert, you’d be forgiven for comparing it to other places beyond our atmosphere. The vast landmass is rocky, with jagged ravines and mountains horizon. While the conditions in the Atacama are generally not fit for humans to live in, some regions can be quite lively. Especially in the city of San Pedro, which is at the heart of the desert. 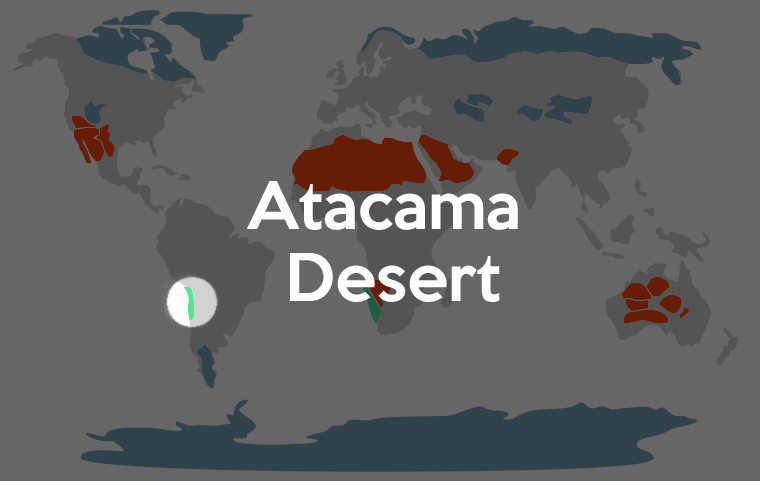 Below is an in-depth profile of the Atacama Desert based on its location, weather, plant and animal life, and general significance of the region. The Atacama Desert is 1,600 kilometers (994.2 miles) long. It is a continuous strip of land occupying an area of over 105,000 square kilometers in the coastal region of northern Chile. It extends from the border of Peru near Arica (18°24′ S) and runs southwards to near La Serena (29° 55′ S). Topographically, the Atacama is a plateau with rises 610 meters above sea level with some of its elevations rising higher than 8000 feet. To the east of the desert are the Andes Mountains. It borders the Pacific Ocean to the west. The Atacama Desert has an average width of less than 100 km. The coastal mountains of the Atacama range between 500 and 1000 meters high. The desert is a series of dry salt basins. Cretaceous sediments form most of the coastal mountains. The sediments comprise mainly of limestone and sandstone that covers a lower layer of crystalline rocks. The Atacama soils have been likened the samples obtained from Mars. The soils limit plant growth because they have extremely low carbon and nitrogen content. In fact, the total carbon levels of the Atacama soils are significantly lower than those present in the Sahara and Mojave Deserts. The Atacama Desert has the largest deposits of sodium nitrate in the world. It also has vast copper deposits, making it a prominent mining site. By definition, a desert should be a very hot region that lacks any meaningful precipitation. The Atacama Desert, oddly enough, is very cold. Temperatures fall anywhere between 0° and 25° Celsius (32° to 75° F). The Iquique range, for instance, has records average monthly temperatures of 21° C (70° F) in March to 14.5° C (56° F) in September. Rainfall is virtually nonexistent in the Atacama. For the last 400 years, the Atacama Desert has not seen a drop of rain. In a rather bizarre occurrence, however, the desert received torrential rain between March 24 and 26, 2015. The rains even caused flash floods. While this is a rare occurrence, it is possible climatically. Other than that, occasional fogs are the only source of moisture. The annual rainfall in Arica is 0.6 millimeters (mm)/0.025 inches and Iquique’s is 2.1mm/0.08 inches. Since the desert is located about 2,500 meters (6,561 feet) above sea level, it records very low humidity in the air (10% or less). This leads to the low and dry temperatures. The Andes Range also contributes to the lack of moisture in the desert because it creates the rain shadow effect. The range, which runs across the Atacama, creates a natural barrier to most winds blowing from the Amazon. Plant and animal life in the Atacama Desert is scarce. In fact, there is almost no vegetation in the northern coastal region. The few plant species found in the region are mainly cacti: Eulychnia iquiquensis and Copiapoa spp. They grow at altitudes of 500 meters. The Iquique region is home to a community of Tillandsia landbeckii, a shrub endemic to Chile. The shrubs grow at elevations of between 990 and 1100 meters (3,248 and 3,608 feet). The region near Antofagasta town is also devoid of vegetation, except for the Eulychnia iquiquensis and Copiapoa spp. The coastal plateaus are home to brush plants such as the Heliotropium pycnophyllum and the Lycium deserti. These plants rely on fog moisture for survival. Isolated mountains and steep coastal slopes trap fog creating a zone of concentrated moisture against the hillsides. The moisture favors the development of plant communities called Loma in the fog zones. Lomas are a major tourist attraction in the Atacama Desert. Animals are rare in the Atacama. Some of the mammalian species found in the region include the Atacama Myotis, which is a bat species; the Elegant Fat-tailed Opossum; the Osgood’s Leaf-eared Mouse; and the Elegant Fat-tailed Opossum. Llamas and huemul deer can also be spotted in the region. The Atacama also has a variety of bird species. The coastal areas have traces of seagulls and pelicans. During Austral winters, the Rufous-collared Sparrow, and the Blue-black Grassquit visit the Lomas to feed on hatched insect pupae. Hummingbird species also visit the Lomas. The northern region of the Atacama Desert is home to restricted and threatened bird species, including the Tamarugo Conebill, Chilean Woodstar, Cactus Canastero, White-throated Earthcreeper, Slender-billed Finch, and the Thick-billed Miner. The only reptile that thrives in the Atacama Desert is the South American Leaf-toed Gecko. It is found only in southern Peru and Chile. The Vallenar toad represents the near-endemic amphibians in the desert. It lives in areas with steams and oases. They breed in streams, rivers and permanent water pools such as tanks. The largest town in the Atacama region is San Pedro de Atacama. It may humor you to learn that despite the Atacama being the driest and one of the harshest environments on the plant, it has a rich cultural history that dates about 11,000 years back. Back then, the desert’s original occupants were highly skilled in fishing, basketry, pottery, and metallurgy. Evidence of this ancient life is neatly tucked in a small San Pedro museum. Today, however, the population is modernized. San Pedro is home to many luxurious resorts, hotels, restaurants and other popular tourist attractions. People come from all over the world to see the breathtaking landscapes, scenery, and Lomas. For survival, some of the communities living in the Atacama have devised innovative ways of getting water. In the northern Chile village of Chungungo, people harvest water from the fog that blows from the Pacific Ocean. For decades, the desert has been a prominent mining site for copper. Between the 16th and 18th centuries, the desert’s inhabitants mined silver. Atacama Desert has also been a rich source of sodium nitrate and it still is. The chemical is used to manufacture fertilizer and explosives. Several cities along the Pacific Ocean and near the Atacama Desert serve as ports to transport the minerals. Major organizations such as NASA and the European Southern Observatory conduct space exploration and astronomy activities especially because the sky is cloudless at night, and the soil in the Atacama Desert is similar to that in Mars. Great information and it was useful, especially for children.